L&C Associates, Inc. of North Hampton, N.H., an industry leader in the design and installation of dehumidification, sealing and monitoring systems for the marine market, is offering a free six-page fold-out brochure titled "The Complete Marine Dehumidification Service." The publication discusses L&C's complete marine dehumidification service that keeps vessels in lay-up shipshape and ready to reactivate. 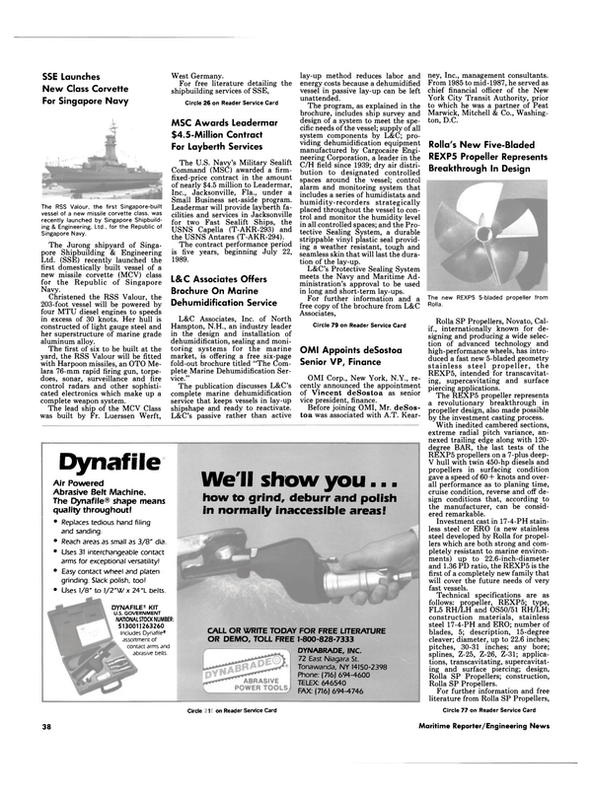 The program, as explained in the brochure, includes ship survey and design of a system to meet the specific needs of the vessel; supply of all system components by L&C; providing dehumidification equipment manufactured by Cargocaire Engineering Corporation, a leader in the C/H field since 1939; dry air distribution to designated controlled spaces around the vessel; control alarm and monitoring system that includes a series of humidistats and humidity-recorders strategically placed throughout the vessel to control and monitor the humidity level in all controlled spaces; and the Protective Sealing System, a durable strippable vinyl plastic seal providing a weather resistant, tough and seamless skin that will last the duration of the lay-up. L&C's Protective Sealing System meets the Navy and Maritime Administration's approval to be used in long and short-term lay-ups.